This plug-in allows you to configure dUninstaller so that you can run it on computers with unwanted software. It includes a plug-in to configure license information and whitelist/blacklist, as well as a script to perform the uninstalls. It can also be configured to run against any group on whatever schedule you like so that it keeps unwanted applications off of your client’s computers. This plugin works with LabTech 2013 – LabTech 11. Note that this plugin requires that you purchase the dUninstaller application so that you have a valid license! To better detail what dUninstaller can do for you, here’s a walkthrough video. Update: dUninstaller can be purchased from this link from FoolishIT and downloaded from this link. 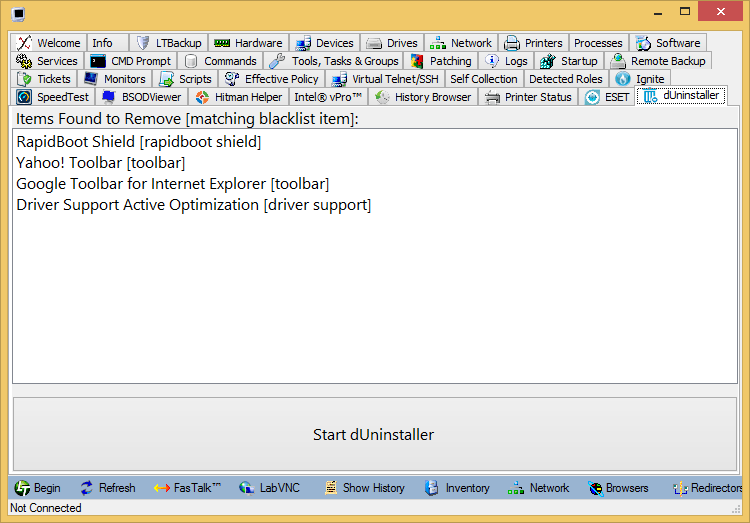 Remove blacklisted applications easily using the power of dUninstaller! You can run the process manually, schedule it to occur as often as you like, or attach the script to a monitor and have it take place when blacklisted applications are detected automatically. Tickets can be created and (optionally) billable time attached for applications being removed. You can create your whitelists and blacklists manually, or use the lists from LabTech. You can also customize ticketing and lists on a per client location to allow more granular control. This single tool allows you to save hours of time removing unwanted applications. New! This plugin has been updated to now use additional tools and steps to better remove unwanted applications from your managed computers. dUninstaller does the heavy lifting, but there’s some extra things going on to help remove more problematic applications. It’s working smarter AND harder! Additionally, the plugin keeps track of how many applications it uninstalls and allows you to report on this. This means that you can easily view repetitive issue computers and generate Excel reports as a value-add for your clients and potential clients! – Install the plugin with the Plugin Installer. – Open the dashboard > config > integrations > dUinstaller and enter your license information. – The first run wizard will help you get your settings configured for scheduling, ticketing, billing and whitelist/blacklist construction. – Open a computer and go to the dUninstaller tab. – Applications are shown that match your filters so you can see what will be uninstalled. 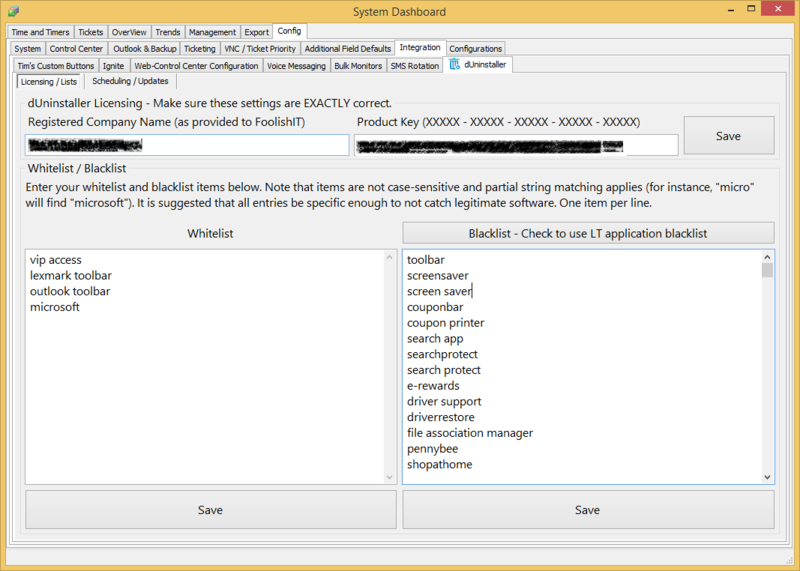 – Click the button to execute the script and uninstall the blacklisted items. – Client level options are set from the client window in the dUninstaller tab and allow you to specify lists and ticketing/billing override options. The use of this plugin has a cost as well. We offer a monthly or yearly subscription option which includes updates, support and usage of the plugin for an unlimited number of agents! Use the Subscribe button above to purchase your license. We are positive that your return on investment will be surprisingly short! Of course! We strive to handle all email support requests and feature requests as timely as possible. Shoot us an email at support@squattingdog.net with your request and we’ll be glad to help. We also offer prompt remote support and love implementing feature requests to help make sure you get the most from this plugin. I am interested in your warranty lookup. Currently we use updatewarranty.com. Does your plugin require a third party subscription to work? Sorry just noticed I posted in wrong section. No, sir. There is no subscription required, you simply pay what you think is fair for the number of computers you manage. Thanks! You buy a single license from FoolishIT and it is able to be used on all of your computers. If we update the blacklist and whitelist information on LT side does it automatically update on the plugin side? If not how to we update the plugin’s list? There is the ability to have the blacklist constantly match your LT blacklist currently. I will be adding a matching setting for the whitelist to be generated the same way in the coming weeks – hopefully as soon as 2 weeks from now. There’s also a few other requests that should be making it into that update (such as client level settings). EDIT: Justin, I didn’t get to the other part of your question. If you choose to manually update the list (default), you can edit the lists from the Dashboard\Config\Integrations\dUninstaller tab. The whitelist and blacklist can both be configured there, and the blacklist can be set to automatic. Is a trial option available for the plugin? Can I have different groups with different blacklists? That is, customer A has a blacklist A while customer B has a blacklist B. Can I schedule automatic uninstalls that uses blacklist A for customer A and blacklist B for customer B? A trial is not currently available. However, if you are not satisfied, please let me know and I’ll be glad to address any concerns or refund your subscription. Client level blacklists is on the roadmap but is not yet implemented. Hi, i can´t activate the trial licence. Please someone can help-me? After imported and activated the plugin, i click in NO on dashboard/integration my trial version isn´t activating, all screen be gray. Anderson, can you send an email to support@squattingdog.net, please? We can help you more directly there. Thanks! Your link to the dUninstaller page goes to their now discontinued version. Does this plugin work with both “d7″ and their new d7II”? It’s not clear from reading the plugin page. I had discussed with FoolishIT before about them rolling the dUninstaller functionality into d7 but didn’t know that it was going to happen to soon. I’ll get some further information and get the appropriate information posted here as soon as I can. I’ve got an answer. The dUninstaller app can be purchased from https://www.foolishit.com/?wp_eStore_buy_now=29, and it can be downloaded from http://download.foolishit.com/dUninstaller.zip. I’ll get these links added to the post. Tim, the installer can’t connect to my hosted labtech server, double checked username, password, Database Name and https and http? Unfortunately the plugin installer can’t connect over http/https and requires a direct mysql connection. I AM working on this. Shoot me an email to support@squattingdog.net and I’ll get you the dll so you can install it directly. I would really like to test this out, however we have upgraded to LT 10.5, is your plugin compatible? Perfect! Thank you for the quick reponse! Hello I am a MaxFocus , MaxRemoteManagement Managed Service Provider, and use all the paid FoolishIT products, do you have a plugin that would work with that product? As of right now, there’s just the plugin for dUninstaller within LabTech. We’ve talked about some other plugins, but those haven’t happened yet.